It is easy to believe the theory that tight end Martellus Bennett was able to talk his way out of playing for the Packers, since he left sufficient enough clues behind to connect all the dots. However, after returning to the field to play for New England on Monday night he said he needed to be convinced into returning to the Patriots after he was claimed by the team after being cut by Green Bay. He added that he told his agent to let NFL teams know not to claim him, as he wanted to have surgery on his shoulder. He added that even after New England claimed him, he said a conversation he had with head coach Bill Belichick was needed to convince him to return. 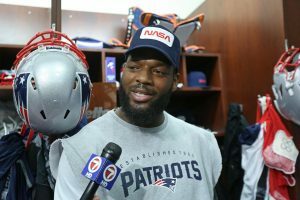 Bennett said Belichick asked him what was taking place about his leaving Green Bay and Bennett explained and told Belichick he would think about reporting to New England and would call him with an answer. He had to have felt much better by returning to New England compared to what he left behind. He was already ruled out of the Green Bay game last week, but when he was released he was able to regroup, and arrive in time to play seven plays on Monday for the Patriots and catch three passes for 38 yards. When ask why the injured shoulder allowed him to play for New England and quarterback Tom Brady, when it caused too much pain for him to play in Green Bay with backup signal caller Brett Hundley, Bennet just replied it was motivation. Bennett said it was not about where he was, it was about his injury. He said he spoke with a half dozen or more doctors about his shoulder and he said it was split between surgery and no surgery. That helped him to decide to go and play ball. Of course, Bennett is aware that type of explanation is not going to satisfy his former teammates with the Packers, who came to the defense of Dr. Pat McKenzie, the team doctor, after Bennett said he was been encouraged to play while hurt. The controversy over Bennett being granted his release from Green Bay and landing with New England will continue for a while. It has been rumored that the Packers organization may try to force Bennett to return some of his bonus money received when he signed during the past offseason with them as a free agent.